Women In Consulting® (WIC) helps members build strong businesses through a variety of educational, mentoring and networking programs. The organization offers monthly meetings with highly regarded speakers throughout the Bay Area while the online community shares everything from best practices, consulting leads and technical assistance to professional recommendations and productivity tools. WIC also offers a tailored mentoring program, its popular Mastermind groups, plus discounts through its partners. WIC also offers sponsorship and partnership opportunities for those organizations interested in reaching this professional network of Bay Area businesses. Silicon Valley, CA — August 28, 2018—Women In Consulting® (WIC), a collaborative community of professional consultants and business owners, announces the findings of its 16th annual Best Practices survey. The survey is based on 150 qualified respondents reporting on 2017 business results and surveyed in the spring of 2018. It includes both members and non-members of WIC plus male and female consultants across the US. The results are a temperature check of how some best practices remain constant whilst others evolve. Participants show a strong optimism and enthusiasm for their businesses. Even consultants who have been in business for over 10 years are finding ways to reinvest and engage in their businesses to maintain and increase value to clients. Respondents are optimistic about the future, with 65% anticipating increased revenues in the next year. Average gross revenue for all participating consultants increased by 15% from $130K in 2016 to $150K. The top 20% also saw an increase this year (of 7%) from $420K to $450K. Their profitability had a more marked increase from $180K to $300K. A newly introduced segment, the Top Third, which appears when there is statistical significance, highlights the average revenue for the top third consultants as $316.5K with profit of $193K. All survey participants, as well as WIC Premium and Leaders Network members, receive a free copy of the survey report when it is published in August. For more details on the 2018 Best Practices Survey and to order the latest copy visit our website. We also saw some refinement of the Best Practices. The top three Best Practices - network to build your business and resources, see and be seen, and ask for what you’re worth - shifted emphasis and are more specifically messaged this year as: Be visible; Build relationships; and Focus on value and outcomes. The umbrella practice of being visible is achieved through networking, speaking and writing. Many comments were around working with clients to define and see value, and focus on the outcomes, not just the actions. Both average hourly fees and average retainer fees increased in 2017 over 2016, while average project fees remained steady. The percent of consultants who are charging project fees instead of hourly fees increased from 70% in 2016 to 80% this year (an all-time high of 81% was in 2015). Use of subcontractors was consistent with last year. Subcontractors are used both to expand offerings and bandwidth, as well as to take care of tasks that others might be better suited to do, freeing consultants up to focus on where they can make the greatest impact. 74% used subcontractors this year, compared to 75% last year and a high of 83% in 2015. 70% markup subcontractor fees to clients to reflect business development, management, and administration costs and time. This increased from 61% in 2016. Charging clients a percentage of the project fee to get started increased slightly from 24% to 27%. Renegotiating fees when project scope changes decreased slightly from 63% to 60% this year (and down from 74% in 2015). San Jose, CA — October 1, 2017—Women In Consulting (WIC), a collaborative community of professional consultants and business owners across the San Francisco Bay Area, announces the findings of its 15th annual Best Practices survey. The survey takes an in-depth look at the state of best practices across consulting firms. All consultants, including those beyond the WIC community, are invited to participate in this confidential survey. The survey was conducted in the spring of 2017 with over 200 respondents across the United States reporting on calendar 2016 results. Fifty-three percent of respondents were WIC members. A decline in application of best practices is correlated with a decline in revenue – Consultants who continued to apply best practices saw revenue growth while those who didn’t saw some decline. Networking is still the number one way to build business and resources. Value-based project fees generate more profit than hourly rates. 88 percent of WIC respondents charge project fees instead of hourly fees, compared to 51 percent of non-WIC respondents. WIC members are more likely to use subcontractors (82 percent compared to 67 percent). 78 percent of WIC members collect a percentage of the project fee up front, compared with 60 percent of the non-WIC group. All survey participants, as well as WIC Premier and Leaders Network members, receive a free copy of the survey report when it is published in September. If you are not a Premier or Leaders Network member of WIC or did not participate in this year’s survey, you can purchase a copy of the report here. San Jose, CA — March 16, 2017—Women In Consulting (WIC), a collaborative community of professional female consultants and business owners across the Bay Area, announces the opening of its 15th annual Best Practices survey. The survey takes an in-depth look at the state of best practices across consulting firms. All consultants, including beyond the WIC community, are invited to participate in this confidential survey, and will receive a free copy of the final results when it is announced in September. In addition to a free copy of the final survey, participants will also be entered into a drawing for a free WIC workshop or one of three general meeting passes. All participants who complete the survey receive the results (normally a member-only benefit!) and are entered into a drawing to win one of four prizes (whether or not they’re WIC members). Contact WIC if you have any questions or encounter any problems. All information collected during the survey is confidential. In addition to the report that WIC sends to all respondents (an email address is required), we also present the preliminary results at a members-only meeting held at Michael's at Shoreline on Thursday, June 15. For more information on joining WIC, please visit our website for full details. WIC also offers sponsorship and partnership opportunities for those organizations interested in reaching this professional network of Bay Area women-owned businesses. San Jose, CA — March 13, 2017—Women In Consulting (WIC), a collaborative community of professional female consultants and business owners across the Bay Area, announced its 2017 Board of Directors. Ellen Grace Henson takes over the two year role of President. WIC, now in its 19th year, supports members in building strong businesses through a variety of educational, mentoring and networking programs. The organization offers monthly meetings with highly regarded speakers throughout the Bay Area while the online community shares everything from best practices, consulting leads and technical assistance to professional recommendations and productivity tools. WIC also offers a tailored mentoring program -- its popular Mastermind groups -- plus discounts through its partners. The Board provides strategic and tactical direction for the organization, working with a team of volunteers to drive the various programs on offer. Ellen is the 2017 President of WIC, guiding its strategic direction and success. She is also the director of programs, responsible for planning and recruiting speakers for the WIC monthly general meetings. She is Managing Director and Founder of Marketing Mechanics, and has been working in product management since the mid-’90s and consulting for 15 years. A thought leader with experience across multiple markets and technologies, Ellen Grace brings a unique combination of analysis and creativity to business and product strategy, market and customer insight, product-delivery process design, and aligning cross-functional teams to deliver high levels of customer satisfaction and strong business results. Katherine continues her second year as WIC’s corporate secretary, responsible for the management of WIC secretarial duties. She is the CEO of digital marketing agency Surfwoman, LLC and has over 20 yearsof strategic sales and marketing leadership. Deb has held numerous leadership positions with WIC, as President, vice president of membership, and director of strategic audiences, heading up WIC’s Leaders’ Network, a role she held for six years. The principal of Strategic Marketing Solutions, she is an astute marketing leader, problem solver and communicator who is an authority in market research, strategy, and customer loyalty and experience. Ann leads all efforts around the promotion and communication of the WIC mission and activities. Ann is an experienced marketing communications professional, with particular focus on the software and services sector, working for major name companies in Silicon Valley to early stage companies and agencies. Candis manages the finances of WIC. She owns and operates Adminologist.com, a service company that provides onsite or offsite contract administrative support. Angel is a returning board member, leading sponsorship and partnership opportunities for WIC. She has served as a satellite director and co-hosts the South Bay WIC meetings. As founder of Success through Learning, Angel specializes in coaching and training technical and foreign-born professionals. Michele is new to the board and is responsible for the Education and Mentorship programs at WIC and also serves as the East Bay Satellite co-chair. Michele is the CEO of Nectar Consulting, Inc. and is a nationally recognized speaker, certified executive coach and consultant. Nancy is a returning board member, leading the team responsible for WIC’s social media presence across all channels, including WIC’s blog. She is the principal of HRProse, LLC, an HR consultancy dedicated to building HR policies and practices that work for small businesses. For more information on joining, please visit http://bit.ly/2m1RVyh for full details. WIC also offers sponsorship and partnership opportunities for those organizations interested in reaching this professional network of Bay Area women-owned businesses. San Jose, CA — August 4, 2016 — Income for Bay Area consultants and other women business owners increased last year, and more of them regularly use best practices in their businesses. These are some of the findings of the 14th annual Women In Consulting (WIC) Best Practices research survey. WIC helps its members build strong businesses through a variety of educational, mentoring and networking programs. The survey covers overall trends in revenue and best practices, including the choice of business structure, use of employees and subcontractors, billing practices, networking, and marketing approaches. The WIC survey team analyzes the responses of the top-earning consultants to identify successful best practices. The team also tracks evolving trends in consulting by comparing results to previous years. “This survey is known for highlighting practical ways women business owners and consultants can strengthen their businesses right now,” said Jennifer Berkley Jackson, WIC’s executive vice president and president of The Insight Advantage. Half the consultants saw their revenue increase last year. Average gross revenue increased slightly (5 percent) to $137,000 over the previous year’s survey. This is the first time the average gross revenue for the survey respondents has exceeded $130,000 since the economic downturn of 2008 and 2009. Profits for the general group increased 11 percent to $89,000. The gross revenue for the top 20 percent of the respondents increased 15 percent. Their profit, which only increased one percent, still averaged more than twice that of the group as a whole. The average hourly rate jumped more than 20 percent over the last survey period. The average project fee remained steady while the average monthly retainer increased a dramatic 25 percent. Consultants are generally optimistic about the future. More than two-thirds of them expect revenues to increase next year. Some of that optimism may be the result of increased collaboration and a consistent emphasis on networking. Respondents are using monthly retainers (46 percent) and project fees (81 percent) rather than working solely on an hourly basis. This is the highest percentage of consultants using project fees in the history of this study. More than a third of the respondents usually collect a part of their fee upfront. More respondents (74 percent) renegotiate fees when the project scope changes. Most respondents (83 percent) use subcontractors and 70 percent of them mark up the subcontractors’ fees. Social media has become an intrinsic part of the lives of consultants, and LinkedIn remains the overall favorite. Overwhelmingly, consultants consider networking to be the best way to build a business. “This survey is an example of how WIC fulfills its mission to help its members grow professionally and build strong businesses,” said Deb Siegle, WIC’s president and the president of Strategic Marketing Solutions. The survey, which was open to both WIC and non-WIC members nationwide, covered the 12-month period from January 1, 2015, through December 31, 2015. Forty percent of this year’s 105 respondents also participated in the previous survey. A comprehensive report of the survey findings is available free for WIC Premium Members and Leaders’ Network members and other respondents. The report is available online for WIC Basic members and non-members for $75 and $110 respectively. San Jose, CA — April 29, 2016—Women In Consulting (WIC), a collaborative community of professional consultants and women business owners, today announced its 2016 Board of Directors. WIC helps its members build strong businesses through a variety of educational, mentoring and networking programs. The organization offers monthly meetings with highly regarded speakers throughout the Bay Area. Members of the email community share everything from best practices, job leads, and technical assistance to professional recommendations and productivity tools. WIC provides other benefits and services such as its new mentoring program with its popular Mastermind groups, and value-added partnerships with companies like Apple Computer and Office Depot. The 2016 WIC Board of Directors consists of the following professionals, who bring years of experience to the organization. President—Deborah Siegle is in her second year as WIC’s president. She previously was the vice president of membership and strategic audiences’ director heading up WIC’s Leaders’ Network, a role she held for six years. The principal of Strategic Marketing Solutions, Deb is an authority on market research, strategy, market and product development, and customer loyalty and experience. She has a talent for aligning a company’s products, solutions and messages with the customer’s needs, and brings a combination of strategic and tactical skills developed through line-management experience at fast-growing companies. The “Silicon Valley Business Journal” named Deb a 2016 Woman of Influence. Executive Vice President of Operations—Jennifer Berkley Jackson returns for her fifth term as executive vice president of operations. She has also served as WIC’s treasurer and vice president of membership. The owner and founder of The Insight Advantage, Jen has a thorough understanding of the impact of customer insight for organizations. She works across a variety of industries, giving companies the means to gather customer input via telephone interviewing, web or print surveys, and focus groups. Jen also teaches the Power of Marketing Research at University of California at Santa Cruz Extension in Silicon Valley. Programs Vice President and Satellite Director—Bobbie LaPorte is new to the WIC board. She is the founder and principal of Bobbie LaPorte & Associates, which provides executive-advisory and leadership-development services to Fortune 500 organizations and promising start-ups. Previously, Bobbie served in GM, COO and CMO roles in several Fortune 50 companies—including IBM, GE and United Healthcare—as well as in two healthcare technology start-ups. A thought leader on how to handle challenges and an endurance athlete, Bobbie understands how today’s professionals can benefit from the strategies and disciplines of athletes. She is currently training for her seventh IRONMAN triathlon. Programs Director—Ellen Grace Henson is the new Programs Director, responsible for planning and recruiting speakers for the WIC monthly general meetings. The managing director and founder of Marketing Mechanics, Ellen Grace has been working in product management since the mid-1990s and has been consulting for 15 years. A thought leader with experience across multiple markets and technologies, she brings a combination of analysis and creativity to business and product strategy, market and customer insight, product-delivery process design, and aligning cross-functional teams to deliver high levels of customer satisfaction and strong business results. Finance Director—Joanne Lehmkuhl is returning as WIC’s finance director for the fifth consecutive year. The owner and founder of Virtual Ms Moneypenny, LLC, Joanne provides administrative support solutions to small business owners. She helps clients free up time to generate more profits by taking noncritical, but essential, tasks off their plate. Her specialties include marketing support, client relations, online research, business systems and resources, and publishing services. Sponsorships & Partnerships Director—Angel Rampy is a returning board member. She served as satellite director for WIC and co-hosts the South Bay WIC meetings. As founder of Success through Learning, Angel specializes in coaching and training technical and foreign-born professionals. Her relationship-systems work with teams has earned her the reputation of being the “team whisperer.” She is one of only a handful of facilitators in California who are certified in cultural intelligence. Social Media Director—Nancy Nelson is WIC’s new social media director. She is the principal of HRProse, LLC, an HR consultancy dedicated to building HR policies and practices that work for small businesses. She is also the program chair for the HR Management certificate program at UCSC Extension Silicon Valley In addition to her work for WIC, Nancy has held various volunteer leadership positions with the Society for Human Resource Management (SHRM) at national, state and local levels, including president of the Bay Area Human Resource Executives Council and director of the California State Council of SHRM. Director of Mentorship Programs—Robin Weintraub is returning as WIC’s director of mentorship programs for the second year. A seasoned strategist and trusted advisor, Robin helps companies create the action roadmap to seize new growth opportunities. After running her strategy consulting firm for 15 years, Robin recently returned to the client side, accepting a full-time position with Salesforce as a director, experience strategy. She has been mentoring professional women since the early days of her career, and is committed to helping high-achieving women develop the skills they need to attain their personal and professional goals. Corporate Secretary—Katherine Van Diepen is new to the WIC board and is the CEO of the digital marketing agency Surfwoman, LLC. With more than 20 years of strategic sales and marketing leadership, Katherine is an expert in B2B and B2C technology marketing, and helps clients in a wide variety of industries fill their sales pipelines. She has lead global teams, and marketed to more than 90 countries worldwide. She’s spearheaded initiatives in product research, development and launches. Her communications experience includes demand generation, marketing operations, product brand management, public relations, social media, website development, and direct marketing. Last year (2014), we were again for the fifth year in a row, awarded the GOLD service award. We are so honored to have had that much of an impact in our community!! Please note: no walk-ins will be accepted at the Second Harvest Food Bank. All participants must be pre-registered. Space is limited to the first 15 participants only!! "Working at Second Harvest in San Jose really helped me understand how far even a small amount of money can go. Second Harvest is a smart service organization that helps people who really need it. I wouldn’t miss the opportunity to help and continue learning about the needs of our community. Plus, it’s just a lot of fun!" Participation at Second Harvest location is limited to the first 15 people who register, so register early! We had a great time at the Second Harvest Food Bank last year (2014). We sorted 194 boxes of apples! 5,000 pounds! SAN JOSE, CA — July 29, 2015— Women In Consulting (WIC) today launched a mentorship program that will help consultants and other women business owners address the challenges of running their own businesses. The highly practical WIC Mentorship Program, which is open to non-WIC members, will allow participants to bounce ideas off their peers, get feedback from experts, and celebrate their successes. WIC Mastermind groups are designed to help participants share resources and networks, develop a trusted support system, and benefit from tested ideas and business practices. The Mastermind participants will act as personal advisors, giving professional advice and opinions, alerting each other to opportunities, and helping each other navigate smoothly past blind spots. Learn more about WIC Mastermind groups here. WIC’s first speed mentoring event occurred on June 18, 2015. More than a dozen experts provided real-time input on business challenges and answered a host of questions—all in tidy, seven-minute segments. The response to the event has been extremely positive. (“It’s like speed dating, but much better!”) WIC plans to host another session in 2016. Learn more about WIC speed mentoring here. SAN JOSE, CA — December 18, 2014 — Gross revenue for Bay Area consultants has remained steady for the past two years; consultants are optimistic about the future; and more of them are using business practices that increase profitability.These are some of the findings of the 13th annual Women In Consulting (WIC) Best Practices and Compensation Survey. WIC is a collaborative community offering professional consultants and small business owners a powerful resource for building strong businesses. The survey covers overall trends in revenue and rates, and examines best practices, including the choice of business structure, use of employees and subcontractors, billing practices, networking and marketing approaches. The WIC survey team analyzes the responses of top-earning consultants to identify best practices. The team also tracks evolving trends in consulting by comparing results to previous years. The survey covers overall trends in revenue and rates. It also examines best practices, including the choice of business structure, use of employees and subcontractors, billing practices, networking, and marketing approaches. The WIC survey team analyzes the responses of the top-earning consultants to identify successful best practices. The team also tracks evolving trends in consulting by comparing results to previous years. “For years, consultants and small business owners nationwide have told us how valuable the survey information is to them and how it has helped them improve their businesses,” said Jennifer Berkley Jackson, WIC’s executive vice president and president of The Insight Advantage. The key revenue findings contained a few surprises. Gross revenue numbers overall are the same as the previous year ($130,000). Average project fees and hourly rates are fairly consistent, and retainer fees are slightly down overall for respondents. However, gross revenue for the Top 20% dropped 10 percent (from $440,000 to $400,000) after growing for two consecutive years. At the same time, the Top 20% made an average of $100,000 more in net profit than the group as a whole. Anecdotally, several consultants reported that projects and budgets are larger than in previous years, especially from existing clients. Consultants are generally optimistic about their businesses. Fully 60 percent of respondents expect business to increase next year. Some of that optimism may be the result of increased collaboration and a consistent emphasis on networking. More consultants are using recommended best practices, such as using subcontractors (up to 78 percent from 74 percent the previous year), marking up those subcontractors’ fees (up to 69 percent from 59 percent), and collecting a part of their fee upfront (up to 18 percent from 13 percent). The vast majority (91 percent) of the survey respondents believe that regular in-person meetings are important, but only 41 percent of respondents report having these meetings. Social media has become an intrinsic part of the lives of consultants. Eighty-three percent of respondents report using social media for business purposes, with LinkedIn the hands-down favorite. “This survey is one of the ways that WIC fulfills its mission to help its members grow professionally and build strong businesses,” said Kathie Sherman, WIC’s president and the president of Ten Four Marketing. The survey, which was open to both WIC and non-WIC members nationwide, covered the 12-month period from July 1, 2013, through June 30, 2014. Almost half (48 percent) of this year’s 155 respondents also participated in 2013. Participants and WIC Full and Leaders’ Network members will receive a detailed report of survey results. MOUNTAIN VIEW, CA — September 18, 2014 — Every year, WIC surveys consultants across the United States to identify trends in marketing, consulting, compensation, and best practices. WIC board members Kathie Sherman and Jen Berkley Jackson will present the results of this year’s survey. The Silent Auction is a great way to pick up great deals on items, services, and experiences you didn’t even know you needed! And, you can even feel good about bidding, because 10% of the proceeds go to the Second Harvest Food Bank. Preview (and even bid on) the items ahead of time. Learn more about our Silent and Online Auctions here! Kathie Sherman, president of Women in Consulting, 2013-2014 and president and founder of TenFour Marketing continues to defy direct marketing statistics by consistently more than doubling her customer’s campaign response rates. Kathie creates automated direct marketing programs that improve and personalize the customer experience. Her customers regularly see two to ten times increased response rates and they’ve tripled their marketing pipelines. Jen Berkley Jackson, WIC vice president of operations and founder of The Insight Advantage, has extensive experience successfully implementing various types of primary research projects for all kinds of organizations, including high-tech, low-tech, consumer services, and more. She also often works as a partner to other consultants, providing research expertise to strategic projects. Jennifer teaches "The Power of Market Research" at UCSC Extension-Silicon Valley. San Jose, CA — April 9, 2014 — Women in Consulting (WIC) today announced the launch of its “Consulting 101” online series designed to help new and prospective consultants succeed. WIC is a collaborative community offering professional consultants and small business owners a powerful resource for building strong businesses. The organization helps consultants throughout the U.S. be successful by providing a way for them to collaborate, share referrals and resources, and stay abreast of best practices. “Consulting 101” will consist of interactive webinars, practical assignments and online “office hours” about topics such as how to define a market, select a business entity, and deal with contracts and finances. Participants will complete assignments about each of the topics, and post them for review by a small group of peers. In effect, they will have access to the expertise of the instructors and the opinions of their peers. To assure participants get the personal attention they need, enrollment in the online series is limited. “Consulting 101” will begin Thursday, May 1, and run almost weekly until Thursday, July 17. The sessions will be at 12 pm PT. For more information and to register, go to www.womeninconsulting.org. October Event to Celebrate 10 Years of "Passion, Purpose, and Perseverance"
San Mateo, CA – September 30, 2008 – Women in Consulting (WIC), a collaborative community of professional consultants and small business owners in the San Francisco Bay Area, today announced that the nonprofit's 10th anniversary event will be held in Mountain View, CA on October 16. Celebrating WIC's "Passion, Purpose, and Perseverance," the event will include a silent auction, a fine art sale, and networking opportunities. Kim Fulcher, CEO of Compass and mylifecompass.com, will give the keynote presentation on "Three Keys for Entrepreneurial Success: Passion, Strengths, and Purpose." 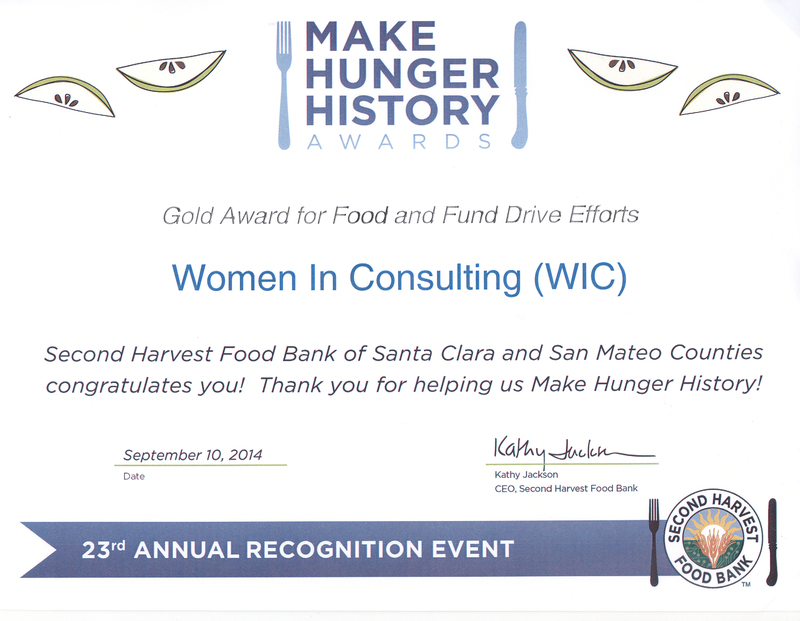 Over the past decade, WIC has grown to more than 400 members and affiliates from the Bay Area and beyond. Representing a diverse range of industry and domain-specific expertise, WIC consultants have deep experience working with and consulting to a wide array of clients—including some of the most respected companies in the world, such as Bank of America, Cisco Systems, Genentech, Hewlett-Packard, Procter & Gamble, and Wells Fargo. Sridhar Ramanathan, general partner at Aventi Group, commented, "The members of WIC are a truly impressive group of highly talented and trustworthy professionals. As a partner in a specialized consulting practice, I've had tremendous success tapping into this wealth of talent and can personally attest to the quality, responsiveness, and overall professionalism exhibited by the WIC consultants that I've hired." "We're extremely proud of how far WIC has come over the past decade in terms of helping members succeed in their individual businesses and consulting practices, as well as building a strong and diverse network of committed professionals," said WIC President Linda Popky. "Our recent compensation survey revealed that WIC members have continued to grow their businesses and thrive despite operating in an extremely challenging and uncertain economic climate. We want to celebrate these collective achievements and set our sights on continued success during the next decade and beyond." The celebration will take place at the Microsoft Conference Center (1065 La Avenida St., Mountain View) from 6:00 to 8:30 p.m.
San Mateo, CA – May 8, 2006 – Women in Consulting (WIC), a San Francisco Bay Area organization of seasoned professional consultants, today announced the formation of its Leaders Network to attract and provide services for senior consultants. Network participants have an average of 22 years of work experience, eight years running their consulting firms, 12 employees, 13 subcontractors, $5 million in revenues over the past three years and an average of 17 projects per year. Piloted and launched this year, the new initiative is designed to not only attract senior, seasoned consultants to WIC and promote the organization, but also to foster collaboration and share knowledge in what can be the solitary profession of an independent consultant. The Leaders Network provides a quarterly roundtable to discuss current business issues and a forum for further development and growth of the successful consulting practices of WIC members. Admission to WIC membership at the exclusive Leaders Network level takes into consideration a number of criteria, such as years of experience, revenue, areas of expertise, number of employees or subcontractors as well as consulting work that takes place primarily with director, VP or C-level clients. A recommendation by a WIC board member or current Leaders Network member is also required. - Elaine Starling, President and Founder, Starling Media Services, Inc. (www.starlingmedia.com): Since 1998, Elaine’s company has provided businesses with a 360-degree approach to media planning and buying. She brings 20+ years of client and advertising agency experience from her work with dynamic domestic and international businesses in the software, Internet, high-tech, telecommunications, toys and entertainment industries. - Molly Davis, Founding Partner, Rainmaker Communications (www.rainmakercommunications.com): Founded in 2000, Rainmaker is a boutique marketing firm offering both marketing strategy and program execution to large and small technology companies as well as service companies including venture capital firms and investment banks. Each Rainmaker partner brings more than 16 years of marketing experience, working directly with a select few clients to support their business objectives with intelligent marketing solutions. - Marisol Pizarro and Linda Tsien, Founders, KnowledgePoint Marketing (www.knowledgepoint.net): KnowledgePoint Marketing was founded in 1997 to deliver strategy development, market research, product marketing, launch management and marketing communications to technology companies. Linda offers clients more than 25 years of marketing and senior management experience in both technology and consumer goods. Marisol offers more than 20 years of high-tech marketing and senior management experience in the US and internationally. Both founders bring extensive experience in the areas of hardware, enterprise software, networking and wireless infrastructure, security, IT consulting services, and consumer electronics and services. Clients include Hewlett-Packard, Sun Microsystems, Adobe Systems, Symantec and Network Appliance. - Barbara Fagan-Smith, CEO and Founder of ROI Communications, Inc. (www.roico.com): This award-winning internal communications consulting firm is focused on helping large organizations adapt and succeed in times of change. Building on more than two decades of experience in corporate communications and journalism, Barbara leads ROI’s work with Fortune 500 companies. The ROI Communications client roster includes Hewlett-Packard, Sun Microsystems, Adobe Systems, Blue Shield of California, Cisco Systems, GAP, Maxtor, Oak Technology and Dreamworks. - Adrian Ott, President and Founder of Exponential Edge, Inc. (www.exponentialedge.com): This fast-growing strategy, and research services firm specializes in igniting revenue growth through innovative marketing strategy and next-generation partner and customer relationships for Fortune 500 and medium clients. Prior to founding Exponential Edge in 2001, Adrian worked in management at Hewlett-Packard for 15 years and was honored in an HP Annual Report for her significant contributions to business growth and strategic alliances. A frequent author of articles about strategy and best practices, Adrian also teaches in an Executive MBA program and has appeared on PBS and CNBC. - Karen Janowski, Founder, KJ & Co. (www.kjco.com): During her 20+ years of experience, Karen has launched more than 30 products, resulting in revenues exceeding $500 million. Prior to founding KJ & Co. in 1997, she served as vice president of marketing for a range of technology companies and was a key member of the executive teams of four pre-IPO startup companies. KJ & Co. helps clients grow by investing in products and marketing programs that target real market needs. The firm's client list includes: Adaptive Planning, Adobe Systems, Cisco Systems, LoopNet, Network Appliance, and Nextance. -Tracy Weatherby, Founder, Active Ingredient (www.activeingredient.com): Tracy’s consulting firm is dedicated to solving product and customer marketing challenges through strategy, research and analysis. She has 20 years of experience in the technology and healthcare markets. The company client list includes Fortune 500 customers such as Cisco Systems, Oracle and Adobe Systems, as well as emerging companies such as Cubist Pharmaceuticals, Placeware and Nextance. The firm’s industry experience includes enterprise, education and consumer technology companies and biotech, medical device and pharmaceutical companies in the healthcare space. - Monica Nester, Vice President and General Manager, Marisan Group (www.marisan.com): Marisan Group has been providing a variety of program, project and business strategy services to the high technology industry since 1990. The company develops customized consultancy and resource services that are fine-tuned to the culture and mission of each client. Marisan Group consists of a diverse, highly experienced group of high technology marketing, technical and business consultants who provide solutions to a wide variety of client needs. Marisan Group makes filling knowledge and resource gaps quick and simple for companies, while providing them with effective budget management. A sampling of Marisan clients includes Hewlett-Packard Company, Symantec, Cisco Systems, AMD and Network Appliance. SAN MATEO, CA – June 19, 2003 – Women in Consulting (WIC) celebrates its five-year anniversary this month as the Bay Area’s top resource both for consultants and companies seeking expert contract assistance. In recognition of its expanding role as a starting point for companies searching for expert consultants, WIC has launched a new website, www.womeninconsulting.org. Founded in 1998 by Eileen LaPorte as a small network of long-time consultants who wanted both to collaborate in consulting projects and to have a forum for continual professional growth, WIC has grown substantially over the last five years. Today the non-profit organization boasts an impressive roster of more than 150 seasoned consultant members who collectively have served more than 1000 Bay Area companies. According to WIC president Kate Purmal, recently honored as one of the top 25 influential women in Silicon Valley, in part for her leadership role at WIC, the organization’s mission has grown with its members and the market. “WIC has become an important resource for Bay Area companies needing a wide range of experienced consultants,” said Purmal. “Particularly in the last two years as the market has been flooded with people forced into freelancing because of lost jobs and little job growth, our membership has continued to stand out in the market. “WIC’s database is the one place companies can go to source a variety of potential consultants, check credentials and whittle their list of potential, experienced consultants to a manageable highly qualified list of candidates – without paying the finder’s fees so common with other professional consulting networks,” added Purmal. For its members and guests, WIC has an active schedule of networking and educational events as well as a multitude of online resources for managing a consulting business. In addition, its email community boasts an active list of more than 1300 people who daily use the forum to find subcontractors, partners and resources.